Wynn Resorts, Limited (NASDAQ:WYNN) has entered into a strategic partnership with BetBull Limited (“BetBull”), a Europe-based digital sports betting operator, to pursue sports betting opportunities in the emerging US market. The strategic partnership will position both parties to capitalise on the developing US opportunity by combining Wynn Resorts’ nationally recognised brand with BetBull’s digital sports betting operations capabilities and technology. 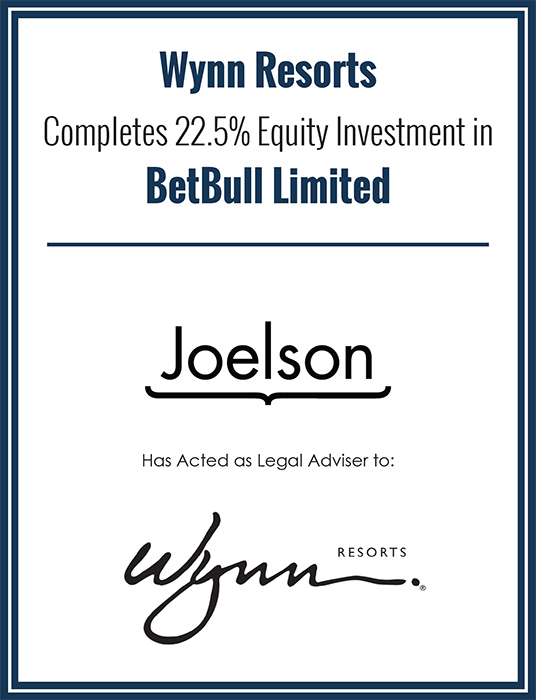 In conjunction with the formation of the strategic partnership, Wynn Resorts will make a minority equity investment in BetBull. Wynn Resorts will own 22.5% of BetBull on a fully-diluted basis upon closing of the investment which will occur in due course; subject to customary closing conditions. Wynn Resorts was advised by Moelis & Company LLC, who acted as financial adviser and Joelson Law, who acted as legal adviser. Joelson Law’s team included Lead Partner Phil Hails-Smith, Partner David Grossbard and Solicitors Maria Michael and Kate Morter.